I am taking the growth of Net-Map to the next level. I have done a lot of project oriented basic teaching. And I have worked with some colleagues over the years who have developed into Net-Map experts in their own right. But I know, if I want this method to become bigger, spread faster than what one small woman can do, I need to be more pro-active and strategic about it. I realize that I don’t just need people who know Net-Map on the beginner-implementer level, who can do a supervised study in Nigeria for us. But I need more method masters, all with their own style, who can play Net-Map like a Jazz pianist plays the piano. And this is why I am now hosting the first Net-Map Master Class for a group of indepentent entreprenneurs in DC. All of them are committed to be involved for 6 months, we meet once a month for 3 hours, in between everyone experiments with the method in their own work, reads up on the background of Social Network Analysis (my old favorite Hanneman and Riddle). When we get together we will see where everyone has gotten, what we can learn from that, how we can do it better next time etc. This class is full. But I know by the excitement that I feel that I want more of this. If not now than later… So if you think that sounds interesting, drop me a line. One hint: I’m in Washington DC and this is a course that only really works if regular face-to-face interaction is possible. 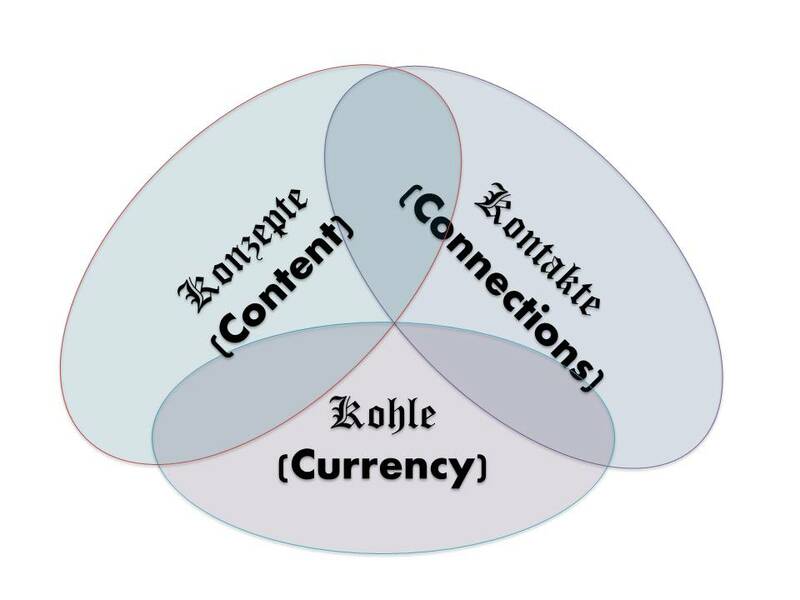 Connections, content, currency… now what does that mean concretely? Let’s start by having a closer look at the connections: what projects are great for connections? If you do your first project in a new field it’s a great connection builder, you go from “no connection” to your first bridge into a new field, that’s the biggest step. Or so it seems. Sometimes it is the second and third project in this new field that really move you from being a one hit wonder to being someone who works in this area. However, the difference between working project 7 and project 8 in this new area will most likely be minimal – at least in terms of generating new links. But there is something else about connection which might actually be more pronounced in project 8 than it was in project 1: And that is the depth and quality of the connection instead of just the number of new links. And often one of the reasons for long term collaborations is the comfort, reliability and convenience found in established good connections. There might even be some clients where you feel a deeper sense of connection (as in “soul-mates”), that makes working with them special. But as my sister said, you want to have at least two of the three. So what about the content? As far as I’m concerned, there are two main ways that content can be great: Either you share the goal of the project and find the content important that way. You want to be the change you want to see in the world. Or you find it stimulating because you learn a lot of new stuff. But you might have different criteria. A lot of people love working on projects where they have a high level of expertise in the content area, for example. Currency? Again, it’s not just “The more they pay, the better.” Even though, obviously, it is great if some of your clients do pay well… But as an independent business person, stability is at least as important as volume. So having a client who doesn’t pay you extremely well can still make economic sense, if this is a reliable long term engagement which gives you some background of stability while you are engaging with less reliable but higher paying clients as well. Now (if you are considering your professional focus) look at your business engagements and make a list: Do they hit at least 2 of the 3 Cs? What if they don’t? Well, sometimes a project just delivers one of them, either content or connections or currency, but this one is so strong that it’s ok if the other two are not met. Do you have enough other work with different focus to balance this one out? Is there any way how you can strengthen the underserved needs in this project, by maybe re-negotiating the pay, making the content more meaningful or being more active in pursuing connections? Or is the most reasonable lesson to let go of it and/or be more concious of the three Cs in future engagements?